Organizations today are more widely distributed than ever before, which can make systems management tasks, such as distributing software, patches, and security policies, extremely challenging. The IBM® Tivoli® Endpoint Manager platform is architected for today's highly diverse, distributed, and complex IT environments. It provides real-time visibility and control through a single infrastructure, single agent, and single console for systems lifecycle management, endpoint protection, and security configuration and vulnerability management. This platform enables organizations to securely manage their global IT infrastructures faster and more accurately, resulting in improved governance, control, visibility, and business agility. Plus, it gives organizations the ability to handle tomorrow's unforeseen challenges. In this IBM Redbooks® publication, we provide IT security professionals with a better understanding around the challenging topic of endpoint management in the IT security domain. 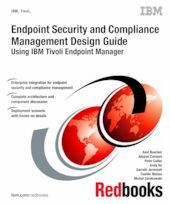 We focus on IBM Tivoli Endpoint Manager for Security and Compliance and describe the product architecture and provide a hands-on design guide for deploying the solution. This book is a valuable resource for security professionals and architects who want to understand and implement a centralized endpoint management infrastructure and endpoint protection to better handle security and compliance challenges.